I've only recently gotten into DC Comics, so Black Manta is a character I'm fairly unfamiliar with. Apparently he's the closest thing Aquaman has to an arch-nemesis. That's pretty intense for a toy package... and it was my understanding that Neron's alterations to Manta had been undone at some point. Whatever; Black Manta is one of Aquaman's toughest villains. Black Manta sports the "lithe adult male" body, as opposed to the "buff adult male" body used by Red Tornado, Electric Superman, et al. It's got the excellent anatomical sculpting we've come to expect from the Horsemen, as well as their trademark shoulders. Since he's just wearing a black wetsuit, Manta has a very basic body (perfect for customizers, though unfortunately he's not going to be as abundant as Superman Blue/Red). The real detail is on his helmet and backpack. As they so often do, the Horsemen find the right way to present the comicbook technology so as to be faithful to the source, while making it look as if it might have some real-world functionality. There are some details one might never even think to look for, such as the two knobs on the back of the helmet and the dial on the back of his neck. 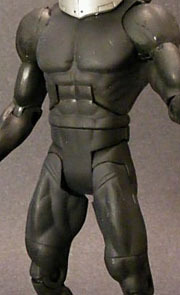 I'm not certain whether Black Manta is molded entirely in black, since the figure appears to have a flat black matte across his entire surface. He could be black, white or gray under there, and I don't want to scratch him to find out for sure. I do like the matte black paint job, which suggests the rubbery material of a professional wetsuit. Again, the best paint work is on the helmet. The silver of the metal is tempered by a faint wash, giving it a realistic look. The purple on the sockets of the tubes, while slightly sloppily applied on my figure, and the bright red of the goggles are nice splashes of comicbook color in an otherwise somber color scheme. Aside from his head, Black Manta has the standard DCUC articulation: balljoints at the shoulders, hinge joints at the elbows, knees, ankles and abdomen, post-hinge joints at the hips (for balljoint-style range of motion), and swivel joints at the wrists, biceps, thighs and waist. The head is a bit trickier; due to its flat, flying-saucer-like shape, it can really only move side to side and somewhat up and down (mostly down). He can't tilt his head at all, but that may make realistic sense given the helmet anyway. Black Manta comes with two accessories: a high-tech speargun and that trademark weapon of the deep, a trident. The trident is fairly simple, but the speargun is a nasty-looking weapon and has some great detail. 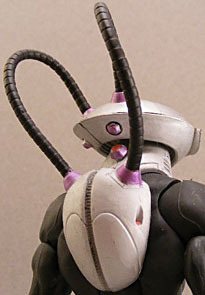 Both weapons have a streamlined, undersea look to them and fit securely in the figure's hands. Manta also comes with Grodd's left leg. I didn't expect to like Black Manta as much as I did. Despite the simplicity of the character design, he's one of my favorites in the series.